“As President and Commander-in-Chief, I take full responsibility for all our counterterrorism operations,” President Obama said at a press conference yesterday about killing an American and an Italian hostage in a US drone strike on Pakistan. What Obama failed to explain: Why the Central Intelligence Agency is allowed to carry out these drone strikes in secrecy. No details were released about how the CIA screwed up the strike so profoundly. This is typical for America’s drone warfare program, which has been operating covertly since its inception. 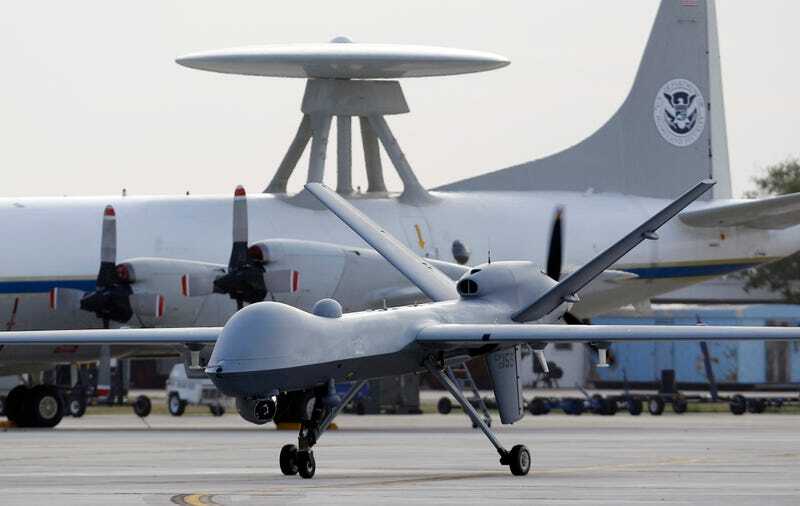 The government isn’t supposed to acknowledge the CIA’s covert actions, so giving it control over drones in Pakistan and Afghanistan is basically ensuring that things will stay opaque. Most memos on drone protocol remain classified; there’s still a galling paucity of information available to the public about the rules for carrying out these strikes. Now, after the first known American hostage death in a US drone strike, the CIA’s absurdly secretive tactics are getting called out, like its rules of engagement that boil down to striking first, and confirming the target’s identity later. The Pentagon handles part of the military drone program, but the CIA is still in charge of carrying out missions in Pakistan and Afghanistan, aka the places where the bulk of the murder-by-drone is going down. This fractured approach means there’s plenty of opportunity for confusion, and information slips through the cracks. The CIA and the DOD have different rules for reporting on their drone strikes, which makes it even more difficult to tease out what happens. Assuming that giving the Pentagon control of the drone program and halting CIA’s involvement will somehow make the program better is naive. But having one program instead of two will make it easier to take stock of what’s going on. Consolidating the drone program to the military definitely won’t immure the US drone program from committing future acts of horrifying, unnecessary violence. But at the very least, moving the program out of the CIA’s hands should make it at least incrementally more transparent. It’d make it harder for the government to deny its drone strikes. Then-Senate Intelligence Committee Chairwoman Dianne Feinstein expressed concerns, and intelligence sources say she inserted a classified amendment in a spending bill last year requiring that the administration certify that giving the Pentagon a greater role would not have negative impacts on the war on terrorism. Sen. Feinstein has also called for greater transparency about US counterintelligence missions— without acknowledging that her efforts to block a Pentagon takeover contributed to the current chaotic and clandestine drone warfare policy. It shouldn’t take the violent death of an American innocent to get the US to pay attention to the horrifying imprecision of its unmanned killing machines, but at least it’s calling attention to what a boondoggle this splintered program is.